Most kids my age grew up playing board games. Our family, like most having little, didn’t experience the luxury of variety. My brothers and I would play the same game over and over. It wasn’t until years later at someone else’s house I discovered not everyone shared my family’s enthusiasm for playing the same game repeatedly. When our host packed up the board after a single game, I was sent into a state of confusion from withdrawals. I never played anything just once. In my young world, playing a game once or twice was pointless. From a competitive standpoint it offered little challenge or satisfaction in victory. However, when a game was played in a four out of seven format, the focus increased greatly through the hope of a greater victory as well as the fear of utter annihilation. I knew these games. I knew every rule. I knew every offensive and defensive strategy. And now, so many years later, recreating these boards was like visiting with old friends. I stared at the Sorry board for countless hours growing up. You would have thought I would have been able to recreate it from memory. You would have thought I would have remembered every nuance, or at least have been able to tell you the dominant colors, but I couldn’t. I suppose when your singular objective is to beat your opponent, your tendency is to overlook some details. I needed a model – something to use for reference. Once I obtained a suitable model, the first thing I did was apply the dominant base coat color which was a light grey with a hint of blue/green. The next task was to lay out the square spaces leading around the Sorry board. I finished drawing all the lines for the spaces only to realize the color of the spaces was white which meant repainting over every line with white and drawing the lines all over again. My frustration made it apparent having a model in my hand would not help me observe the proper order of doing things no matter how many times I referred to it. There was no condemnation for my ignorance, only the unsympathetic consequence which led me to the understanding it would have been helpful to have had someone familiar with the process to guide me. For example, with paint, you generally apply darker colors first and then the lighter. However, with markers it’s the opposite. You paint the lighter colors first because if you don’t, when the light color marker ink touches darker marker ink it dissolves the darker ink which is absorbed into the felt corrupting the lighter colored marker. 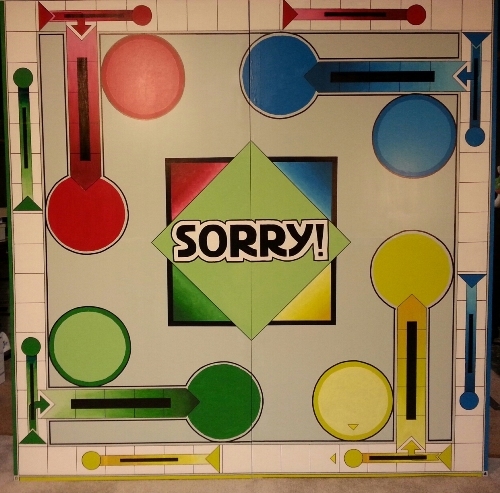 Staring at the Sorry game board for a thousand hours as a child did not show me how to see. All my confidence and familiarity with the subject, in retrospect, was actually a stumbling block. It was three days before I noticed the small directional triangles. In all my years playing the game I had never noticed the double line boarders. It was disturbing how little I actually knew of something I would have sworn I knew so well. The Bible uses the Hebrew verb yada, to know, which ranges in meaning from the mere acquisition and understanding of information to intimacy in relationship, including sexual relations. This implies there are levels of knowledge ranging from the valueless and superficial to the intimate which has the power, as in a sexual relation, to unify in marriage and bear fruit. Staring at the model for all eternity would not help me get to an intimate level of knowledge. I needed to recreate it physically. Now, after putting myself through the complete process I know each square is four and a quarter inches based on a six foot by six foot board and there are sixteen spaces across. I now know every detail, diameter, circumference, color and shade. Today I know this board so well, I no longer need the model. The biggest mistake Christians can make is to think they understand the model simply because they read the rules and know how to play the game. After fifty-sixty hours of tedious labor, it was hard not to relax where details were concerned. It would have been easier to just paint one solid color rather than incorporate the gradual changes, but that’s not the model. Just like it would be easier to pick and choose in what instance my yes means yes and my no means no, but that is not the model. Developing good character is far more complex than duplicating a game board. It stands to reason if our intention is to imitate a model’s behavior we should require the same things necessary to recreate a work of art. If a model, guides and tools are required to recreate art, then the Bible, a Pastor, a concordance, bible dictionary and study guides, and their practical application, would be necessary to recreate character. It is our responsibility as faithful followers of Jesus Christ to do more than have a superficial secondhand knowledge of our Savior. If our goal is to know him intimately, we must recreate him in ourselves physically through every means available to the extent we become a true model worthy of duplication.